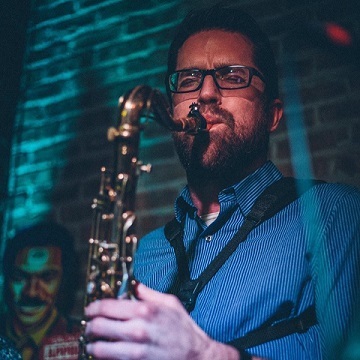 CRISP's humble beginnings date back to August of 2013, when Elburn, IL native Kevin McMahon (Bassist/Bandleader) moved back to Illinois after a living in New Orleans for the previous five years. Upon his return to the Chicagoland area, he had a goal in mind; to assemble a band of like-minded, talented musicians to compose and perform original Funk/Jazz/Fusion music, in a time when DJ's and tribute bands rule the landscape of modern nightlife entertainment. Through various professional relationships and personal friendships, Kevin is honored to have secured the talents of Stewart Ream: Keyboards/Vocals, Constantine Alexander: Trumpet, Ian Letts: Saxophones, Joel Ream: Guitar/Vocals, Andy Schlinder: Saxophones, and Greg Essig: Drums, to our line up of sensational musicians. 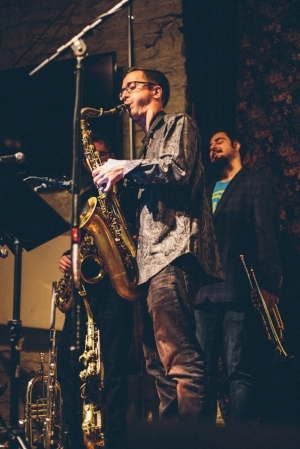 Over time, CRISP has come to embody Fusion driven composition with open improvisation. Or as we prefer, PROGRESSIVE JAM FUNK...ENJOY. 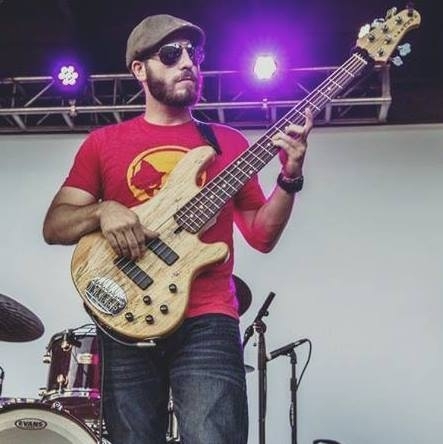 Kevin McMahon was born outside of Philadelphia, and grew up in Elburn, IL, and has been playing bass since he was 14 years old. His gigging tenure began at age 17, when he founded the local high school band SuperFlannel, whose other founding notable members included Joel Ream (CRISP, Xavier Breaker Coalition) Matt Keen (Rebel Soul Revival) and Drew Deopke (Rebel Soul Revival). After graduating from Elgin Community College in 2008, he moved to New Orleans where he would bounce around between working as a Commercial Diver in the Gulf of Mexico, to a Professional Brewer for Abita Brewing Co. In August of 2013, Kevin found himself back in Elburn wanting to fulfill an almost 10 year aspiration; to have a Funk band...a BIG Funk band. Full of wailing horns, shredding guitar, powerful drumming, and tasty piano licks. This band embodies that dream. Kevin could not be more honored to share the stage with such classy, talented, wonderful players, and good friends that make up this seven piece collaboration we call CRISP. Kevin also plays bass for the rock group Rebel Soul Revival and hosts the Chicago based Indecent Exposure Podcast. Constantine Alexander attended Lincoln Park High School and was apart of the NIU Jazz Ensemble directed by Ron Carter. He toured and played with many artists including Ernie Watts, Randy Breaker, Brian Lynch, and Paquito D'Rivera. Graduated from Roosevelt University and studied with Scott Mason, Paul Wertico, Henry Johnson, Tom Garling, Roger Harris and Victor Garcia. www.ianlettsmusic.com or visit his FaceBook page at www.facebook.com/ianlettsmusic. 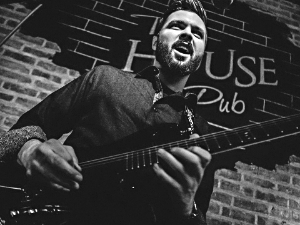 Only in the prime of his 20’s, Joel Ream has been playing guitar for 15 years and is quickly becoming a rising name in the scene around Chicago. Originally self taught, he started taking lessons in high school and moved on to study guitar with the world-renown Fareed Haque at Northern Illinois University where he got a bachelor’s degree in Music Performance and Jazz Studies. However, Joel does not stop at jazz; he excels at rock, funk, blues, r&b, fusion, and anything in between. He is always reaching for the next level and exploring new sounds, through melody and harmony or tweaking effects with his feet. He strives to push the music but also knows how and when to give it what it needs, and is always down to just groove. Joel is also member of The Xavier Breaker Coalition, and plays frequently in and outside Chicago. Check out www.joelream.com for more info. Greg Essig is a caucasian man, average build and very bald. He also plays drums. Goodly? Baldly? Well, it's up for debate. In a recent inverview, Mr. Essig had this to say on the matter, "I do, from time to time, lat the drums and thing of playing them, but my rhythm isn't very good. That's a weird word, 'rhythm'. RHYTHM. RHHHHYYtham, I can't even spell that!" His learning disabilities aside, Greg is a decent person, and is excited to be a part of CRISP's musical journey. Jerry "Jay Flat" Williams was born and raised in the south suburbs of Chicago. Exposed at a young age to many different types of music has giving him the tools and knowledge to play many different genres of music, such as Funk, Latin, Reggae, Pop, Jazz, Calypso, Rock, Soca and R&B. While proficient on soprano, alto, tenor, and baritone saxophones, Jay Flat also plays flute, clarinet and steel pan. He has worked with distinguished musicians and artist such as, Louis Price; former lead singer of the temptations, Wycliffe Gordon, Liam Teague, Freddy Harris III, Matthew Tembo, Gary Smulyan, Franco Da Vita, Ice Cube, Snoop Dogg, and Mary J. Blige just to name a few. Jay Flat earned his Bachelors of Music Performance Degree at Northern Illinois University and working several new projects set to be released next year. Andy Schlinder is a Chicagoland saxophonist and repairman. He plays in the area with several noted groups including Bill O'Connell's Chicago Skyliners, Lynne Jordan and the Shivers, The Bluewater Kings, Pete Ellman big band, Angel Melendez, EHJO, Shout Section Big Band and his own quartet. He has also played with the Glenn Miller Orchestra, The Tommy Dorsey Orchestra, Buddy DeFranco, Marcus Printup, Jeff Coffin, Ben Folds, Wayne Bergeron, Eric Marienthal and Willie Torres. He recently started a saxophone repair business called AP Saxohpone repair and also works at PM Music Center. He feels lucky to be busy making a living doing what he loves. CRISP's line up of band members has fluctuated during their culmination and uprising in the Chicagoland music scene. We'd like to recognize, and thank, our good friends Ryan Bobwick, Chris Werve, Gabriel Ortiz, Steven Ortiz, Mark Roller, and Matt Kellen for their past contributions and influence on what this project has become, and wish them the best of luck in their future musical endeavors. CRISP's Debut Album "How Many People can you Bring?" nOW aVAILABLE!